An under-strength squad; a lengthy roundabout journey ala Planes, Trains and Automobiles; a bumpy pitch and equatorial heat and humdity; and a raucous 35,000-strong flag-waving partisan crowd. Add the kickoff time at which you and I would otherwise have been lazily sipping at a nightcap before turning in for bed; and we are of the same time zone as Indonesia, mind. The things football players are willing to go through just to play an international friendly! Conditions were rife, it can be argued, for epic fail. In a night when positives were scarce for a Philippine football team forced to deal with such adversity, if at all we have to scrounge for one, it will be that we got off lightly with a mere 0-2 defeat. 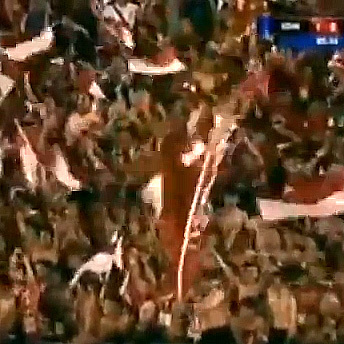 It was not so much that Indonesia were overwhelmingly superior but more that we were abjectly poor. Those who follow the fortunes of the Azkals would have already come to terms with the reality that with the current crop of players that we have, the absent expatriates included, we will not really play pretty Spanish-style tiki-taka. We gave up a lot pulling James Younghusband down into the backline. Michael Weiss will have his reasons, but the day Angel Guirado learns to cross the ball is something Attorney Topacio can wager the second of his testicles on. But we have all also started to appreciate the battling midfield and the organised and frugal backline from which we launch the unsightly but somehow effective long balls that we get our goals from. Neither of which, unfortunately, came to last night’s soiree with Indonesia at the Manahan Stadium in the Central Java city of Surakarta. Long before Greg Nokolo opened the scoring for the hosts in the 31st minute, there were gaping holes in the middle of the park which the Indonesians exploited with intelligent off-the-ball running. The unfamiliar central defensive partnership of Rob Gier and Carli de Murga had the look and feel of strange bedfellows and were repeatedly unlocked by over-the-top balls. That said, it says a lot about Indonesia’s quality – or, it can be argued, the lack of it – that despite their flattering possession statistics, most of their shots ended up as problems for the ball boys in Row Z. Although Ed Sacapaño had to fish the ball out from the net twice, the fact still was that the night was relatively peaceful for him. 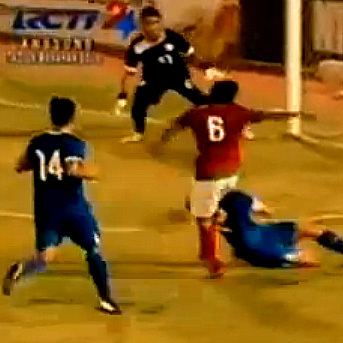 In fact, both Indonesian goals had equal parts of good fortune and bad defending. Nwokolo’s opening goal carried with it a suspicion of offside; but a ball-watching defence allowed Stefano Lilipaly to ghost into space inside the box and deliver the low cross from which Nwokolo scored. The second goal, scored by Muhammad Roby in the 66th minute, was crafted with the same elements. That Indonesia won a corner at all when the Philippines were starting to see more of the ball was fortunate; but the defending was Sunday league. 18-year old Amani Aguinaldo was probably happy to be getting his first full international cap after coming on for James Younghusband in the second half. 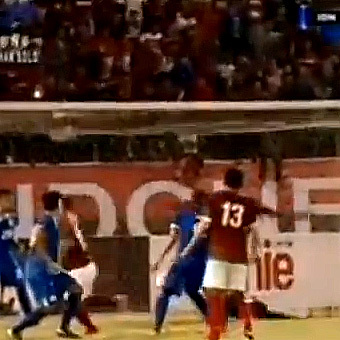 But it was off his head that the corner was deflected into Roby, whose header left Sacapaño with no chance. Last year at the Rizal Memorial, despite the Indonesians leading 1-2 and the Philippines having been reduced to nine men, an equaliser and even a sensational winner never seemed improbable. Not so last night; and one will struggle to recall any incident of note when the Indonesian goalkeeper was really made to earn his pay for the night. This was alarming. Phil Younghusband cut such a forlorn figure upfront that he might well have brought Angel with him – and a bottle of wine – to keep him company. The problem with sitting back deep in defence – as the Philippines did in the first half – and playing long balls is that such a tactic is always premised on the accuracy of the pass, the ability of the target man to hold up play and the quickness of support to arrive. It never quite happened that way last night. To begin with, Younghusband plays best when facing goal. He is arguably better playing off a bigger man than being the lone striker upfront. The passing was also quite mediocre whether short or long; so that players spent so much more time, especially early on, mopping up balls given away on the cheap to offer much going forward. We also needed somebody to sit in front of the central defenders to link up play. That we even have such a player is food for thought. Chris Greatwich is a proven warrior; but passing is not his strongest point. Mark Hartmann, with his range of passing, comes to mind; but he often finds defending beneath him. Weiss was probably correct to start with his tried and tested players. Although the finals of the Challenge Cup is still months away, it is important to keep the core of the team playing together even in these so-called ‘meaningless’ friendlies. There were suggestions before the match that it would be used to give playing time to members of the U-23 side in preparation for the SEA Games. First of all, SEA Games participation is not even a certainty as yet. The U-23 side will also be better served if it plays friendly internationals of its own. That said, Hartmann and Aguinaldo did get on; as did the returning Jerry Barbaso. OJ Porteria, Marwin Angeles and Jeffrey Christiaens have been involved with the senior team for sometime but are all still eligible for the SEA Games. It is important to ease younger players through in these friendlies as well as keep the fringe players involved.